OneNote can be used to take notes, organize thoughts, do research, and collaborate with others on projects. Microsoft OneNote’s 2010 new formatting and styles capabilities are tailored to organize information and suit most individual’s needs. This basic Microsoft OneNote 2010 Essentials training course from PD Training is designed to teach you how to open and close OneNote, how to use the backstage view to create a new notebook, how to use the backstage view to save, print, or share notebooks, how to open, close, save, and search a notebook, add pages and sub-pages and move, rename, and delete them and so much more! 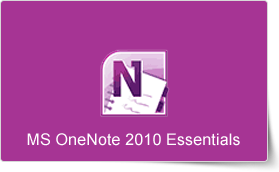 This Microsoft OneNote 2010 Essentials training course can be delivered at your premises by one of our expert local or international trainers or live online using our HIVE technology. Have you ever wished that you could track appointments, take meeting notes, record research, and keep to-do items all in one place? Well, you can do all that and more with OneNote 2010! In this course, we’ll show you how.